James Jamerson had no peer. 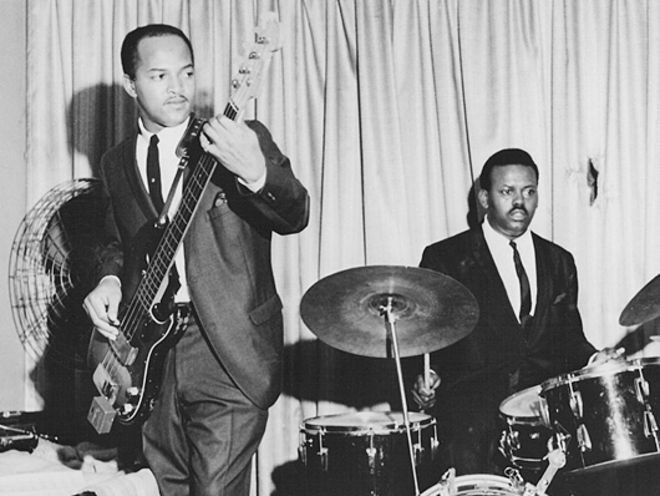 Even at Motown, who could also call on the services of Bob Babbitt in Detroit and Carol Kaye and Wilton Felder in LA*, Jamerson stood tallest, at the apex of the art. The factory ethic at Motown instilled by Berry Gordy militated against too much individualism on the part of its players. Stylistically, the musicians that came to be known as the Funk Brothers played in a house style. Jamerson was the wild card. Jamerson could not be constrained. His outrageously (in their context) chromatic, syncopated and rhythmically complex lines seemed to come from somewhere deep within him, and he was wisely given the freedom by Motown’s producers** to play what he felt. Any of the bass players associated with Motown could play tight, tidy, groovy lines. Only Jamerson could rip your heart out. His bassline on the title track of Marvin Gaye’s What’s Going On has been admired and deconstructed by fans for four decades now, and it remains a thing of wonder. The story, whether it’s true or not, goes that Gaye was determined that Jamerson should play on the track and tracked him down, already drunk, at a local club and asked him to come by the studio. Jamerson, too drunk to sit upright, played the line horizontally. Arranger David Van DePitte claims to have written a part for Jamerson , which the latter played verbatim. If so, he captured Jamerson’s style perfectly. Listening to the isolated part, I find it hard to believe that all the little Jamersonian licks were written by Van DePitte, but then we are talking about a couple of musicians of the very first rank. The fluidity, the sheer ease, with which Jamerson plays these complicated runs (listen to the part he plays on the B chord at the end of the first verse to hear the sort of thing I’m talking about) is what defines him as a player. Most of us can’t get near this. When most of us play complicated stuff, we make it sound complicated. Jamerson made it sound beautifully simple. *There’s an extremely long-running controversy over the authorship of bass parts on Motown records, with Carol Kaye laying claim to some parts that thitherto had been considered signature Jamerson performances (I Was Made to Love Her is the most contentious). Kaye has an impeccable CV, so one would assume no reason to fabricate a story like that. Still, it’s hard to give her story much credence when numerous Motown insiders have denied it. Can they all really be complicit in a cover-up? **Jamerson had the great good fortune to work under producers and songwriter-producer teams including Smokey Robinson, Holland-Dozier-Holland, Henry Cosby and Norman Whitfield. None of them got where they did without learning to get out of the way of genius. This entry was posted in Music and tagged 1970s, arrangement, arranger, bass guitar, bass guitarists, bass guitars, bassists, Berry Gordy, Bob Babbitt, Carol Kaye, David Van DePitte, Detroit, Funk Brothers, Give Some to the Bass Player, groove, Heny Cosby, Hitsville USA, Holland-Dozier-Holland, isolated bass and drums, James Jamerson, LA, Marvin Gaye, Motown, Norman Whitfield, Smokey Robinson, syncopation, What’s Going On, Wilton Felder on May 19, 2015 by rossjpalmer.